I Love You More Than Carrots: The Ultimate Giveaway To Beat The Winter Blues! The Ultimate Giveaway To Beat The Winter Blues! Who's tired of Winter? Did you raise your hand immediately? Maybe shout "ME! ME! Me" at the top of your lungs? Well, then do I have a tiny treat for you! For those of you who are new-ish around here, I am a a registered nurse turned stay at home mom to two beautiful boys and a third due early spring. When I'm not growing a human, I prefer my wine from a (large) coffee mug and have a special place in her heart for Cakebread Chardonnay. My greatest accomplishment? Surviving four years and two boys without a trip to the ER. Although I know that parenting badge is right around the corner. After finding earthworms in the fridge on more than one occasion and catching vomit with my bare hands, I can honestly say that nothing surprises me anymore. As a mom to two handsome and devilish (or is it devilishly handsome?) boys under the age of four with a third due this Spring, there isn't a whole lot of time each day to devote to myself. Throw in a Polar Vortex or two and top them off with perpetual cabin fever and it's easy to fall victim to a bad case of winter blues. Two "treats" that have become an integral part of my day to day is the Naked3 Palette (it goes great with yoga pants and over-sized cardigans) as well as a Grande Non-Fat Caramel Flan Latte from Starbucks with extra whip. One makes me feel just a little more dressed up and ready to take on the day and the other, well, it supplies just the right amount of caffeine necessary to transform from a superhero to a train conductor to a top chef and do it all again an hour later. Here's to hoping these two things will help do the same for you, especially if you too, find yourself stuck in a bit of a winter rut. Want to read more about my caffeine-fueled many mis-adventures in mothering? Follow me on the social media links above! Rebecca is the voice behind the blog, A Beautiful Ruckus. She's always loved writing (heck, she majored in it! ), but didn't realize what an important part of her life it would become. Rebecca and her husband, Sean, welcomed boy/girl/boy/girl quadruplets three years ago, and Rebecca has been non-stop writing since! How else is she supposed to remember all of the milestones and antics that her quaddlers come up with? She loves inviting people to peak into their lives by reading stories on her blog. She also has other fun stuff like kids' activities, recipes, and giveaways...but the majority of the blog is about raising quads and figuring out how to mother four at the same time. When she isn't changing poopy diapers, she loves reading, eating desserts, and watching mystery and comedy shows on Netflix. And naps. Naps are also a huge highlight of her day! She says: "Winter is admittedly not my favorite season. I'm a New Mexican transplant living in the cold and icy Midwest. When the snow starts falling, I burrow in and contentedly watch the snowflakes from inside my warm house. While I don't love the cold, I do love the beauty of an all-white landscape and the serenity that comes with it. Unfortunately, with the cold comes chapped lips and hands, and the frustration of trying to keep skin moisturized. I'm hoping that my prize makes your day a little softer and brighter! I'm giving away a Burt's Bees Tips N Toes Hands and Feet Kit to help with your dry skin. And because wearing personalized jewelry always makes my day brighter, I'm also giving away a handmade stamped necklace with your choice of initial from my favorite jeweler, VictorianaGlen!" Lisa is the Creator & Editorial Director of Mom a la Mode, a blog that celebrates food, fashion, family life, pop culture and travel in the NYC Metro Area (and beyond!) If she's not dishing on the latest red carpet fashions or creating her own recipes for family-favorites for her husband and toddler son, she's chronicling her on-the-road adventures or reviewing the latest toy or arena show in the NY Metro area. "I created this blog from my passions for food, fun, family and good living," says Lisa. "It's been such a rewarding and enriching experience to have a daily dialogue with my followers and readers -- I'm constantly learning something new from them (and I often post about that on my blog!). That is what I love the most about being active in social media -- the sharing and connections. And above all -- the inspiration." She says "I'm going to be honest with you: Winter is my LEAST favorite of the seasons. So that's why it's super important for me to keep myself and my family as busy and creatively-charged as possible to fight off those Winter Blues. In the Mom a la Mode household, we do that in the KITCHEN! The colder and snowier it gets, the more I cook and bake. Soups, rice bakes, snow cakes, interesting twists on egg rolls -- the more it snows, the more innovative my concoctions get. In the spirit of creating in the kitchen to beat the Winter Blues, I'm gifting a Play-Doh Sweet Shoppe Double Desserts Play Set to keep the little ones busy "baking" inside when the weather gets rough outside. Then for mom, a Weelicious cookbook, Stonyfield Yogurt and Funny Face Cranberries for some "feel-good food" to make for real. Enjoy!" Kate from Style Smaller lives in San Francisco with her husband and two little girls- Sophie & Maggie- whose mini style inspired the creation of the blog. Style Smaller is lifestyle blog; it's all about the places they go, the things they do, the looks they love, the people they meet, and the thoughts they think. She says "We don't have a harsh winter, but we get some chilly foggy and windy days, and we love bundling up and going for walks to have hot chocolate at local coffee shops. We love getting stylish in winter cozies on our walks, so I'm giving away our favorite scarf: the Tapestry scarf by Peppercorn Kids. My kids take turns wearing this scarf, and takes any little outfit up a notch. We're throwing in a couple fun gold bead bracelets in too, because accessories make an outfit!" The Chirping Moms are best friends that met at a neighborhood park in New Jersey. Courtney, a mom of two girls, and Julie, a mom of two boys and a baby girl, decided to jump into the world of blogging about 1 1/2 year ago on a rainy spring afternoon. Recently, Julie moved to the DC area but they have continued to enjoy writing the blog together despite the distance between them. Together, on the blog, they share their adventures in motherhood along with activities for kids, crafts, recipes and ideas for family travel. They say "Winter has hit our towns hard this year. Preschool has been cancelled often and many days have meant staying in the house for hours. We have come up with some fun ways to keep the kids busy inside, but long for days at the park. One of our favorite things about being stuck inside all day: staying in our warm pjs and enjoying warm coffee or tea. We've decided to give away a pair of our favorite pjs from PJ Salvage with a matching coffee mug. As long and crazy as "snow days" can seem, with you're a crew of little kids, it's fun to make some cozy memories snuggling together or adventurous memories out in the snow. These winter months seem long, but the years fly by. That's why we're also giving away a vintage growth chart ruler. These rulers from Carone Creations are handmade by a loving mom. They are a beautiful way to track your growing family. Remember, spring is right around the corner!" 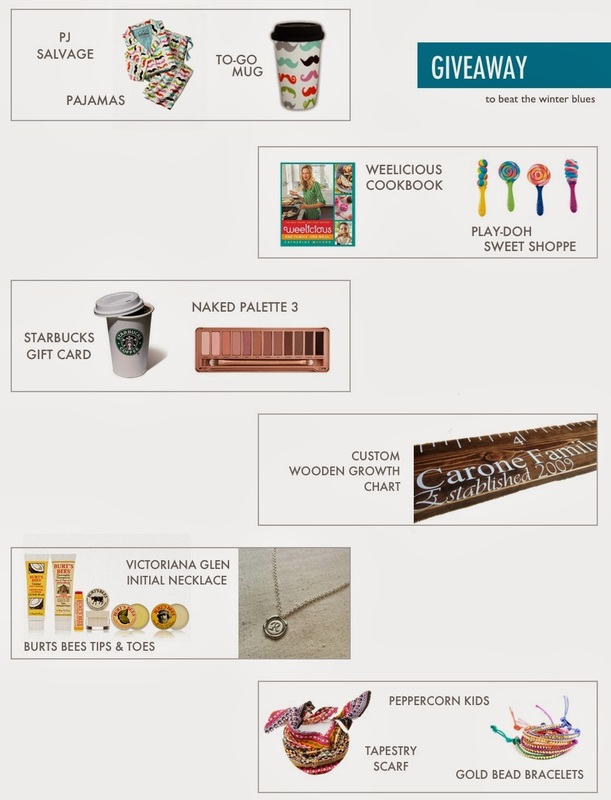 Oooh, I would LOVE to win all of this especially the make up! I visited A Beautiful Ruckus! I visited Lisa @ Mom a la Mode!! Wow! What a great giveaway! Everyone can use a winter pick-me-up! I comment on The Chirping Moms! I visited The Chirping Moms. I visited The Chirping Moms! What an amazing giveaway! I'm wishing this winter far away!!! What an amazing giveaway! I'm wishing winter far away! 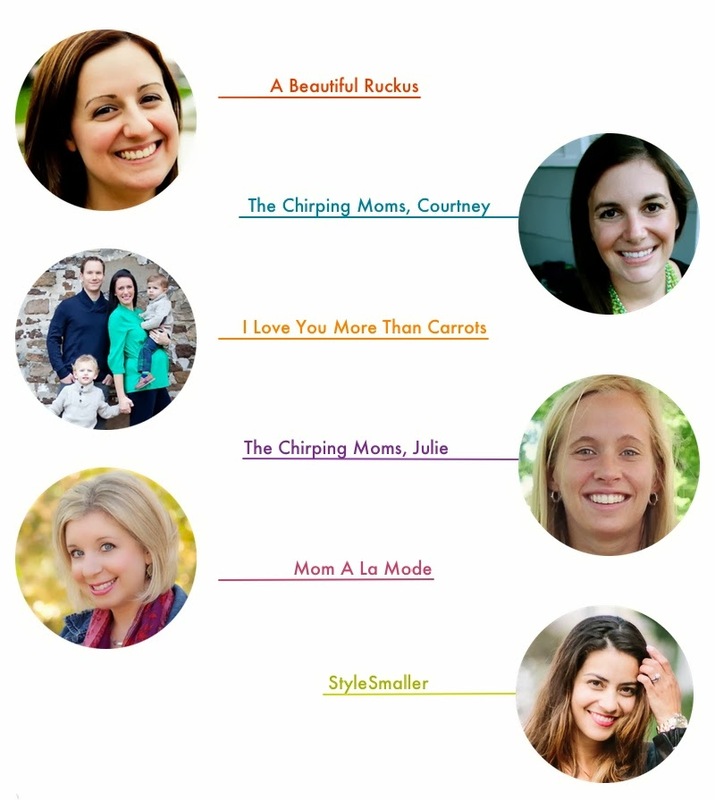 I visited The Chirping Moms......cool blog!!!! Love those PJs...and everything else too! Love the PJs...and everything else too!!! I visited a beautiful ruckus - because holy cow! Quadruplets?!? I visited Lisa @ Mom a la mode, great blog! I always check in on The Chirping Moms! I can't even... After this winter, those supplies would be so helpful! I hit it too soon! I luuuurve The Chirping Moms!!! by far my favorite blog author! and what a fun giveaway on top of that! Just visited Rebecca from A Beautiful Ruckas!! Such a sweet blog. This is seriously an awesome giveaway! The growth chart, the burts bees... and starbucks- seriously! i just visited mom a la mode! I visited Style Smaller. Great blog. Thanks for sharing. I just visited Style Smaller. Great blog. Thanks for sharing. Awesome giveaway! I live in the Midwest so it has been a crazy long winter. I have 5 kids so the cabin fever around here is craziness!!! Love reading your hilarious antics! You definitely put a smile on my face and remind me that I have to laugh at myself or else Motherhood will swallow me whole! I love reading stories about your boys. They remind me of my two boys! This is great! I could really use a winter pick me up! I'm definitely going to check out some of the other blogs. This is great - I could really use a winter pick me up! And I'll definitely check out some of the other blogs... always looking for new good reads. Just visited A Beautiful Ruckus. Quadruplets, WOW! I visited Chirping Moms! I also follow then on pinterest and love their pins :) Would love to win this giveaway!! I visited the Chirping Mom's. Great find, I had honestly never heard of it before and I think I'm in love! What a great giveaway! My favorites!! I visited A Beautiful Ruckus. Quads.....wow! Thanks for the amazing giveaway! I visited The Chirping Moms! Love this giveaway! I love this giveaway! I really enjoy reading all the blogs too! My One Fear Before Number Three. Mortifying Mom Moment, Top 3 For Sure. Debunking the Myths of Motherhood.